This study, presented to the International Whaling Commission, demonstrates that both powerboats and kayaks can (but do not always) elicit short-term behavioral responses in northern resident killer whales. 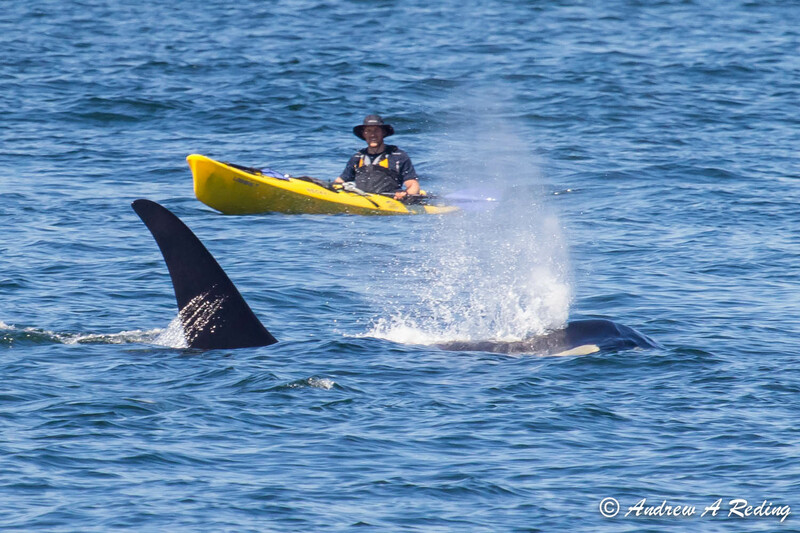 While powerboats caused whales to spend less time feeding, this effect was not seen with kayaks. Kayaks did, however, cause killer whales to increase energy expenditure as they increased swimming speed to evade kayaks. In years when prey (Chinook salmon) was abundant, the effects of power boats on killer whale behavior were diminished as killer whales spent a higher than average proportion of their time feeding even when boats were around. In years when prey were scarce, killer whales spent less time feeding overall, and reduced their time feeding as number of powerboats increased. This study gives us yet another reason to not treat prey availability and disturbance as separate risk factors or separate action items to promote recovery. They are inextricably linked. Williams, R., Ashe, E., Sandilands, D., Lusseau, D. 2015. Stimulus-dependent response to disturbance affecting the activity of killer whales. Paper SC/63/WW5 presented to the Scientific Committee of the International Whaling Commission.